Besides being able to kick back, relax and enjoy the scenery, one of the few skills required of canal cruisers is being able to work a lock with confidence. 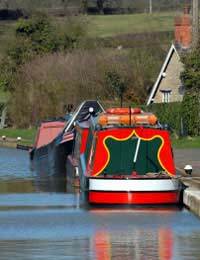 Although Britain’s waterway network is generally undemanding of its users, every now and again boaters must face the challenge of the lock. On major rivers such as the Thames and the Severn, there is little need for lock working know-how because the locks are typically manned by dedicated lockkeepers. But on canals, and some rivers, the locks that interrupt the journey must be operated by boaters themselves. Learning how to work a lock with ease is therefore a must for all waterway users. If you have never worked a lock before then the whole process can at first seem quite daunting. However, one you grasp the clever simplicity of their operation and try it out for yourself, it won’t be long before you are working locks with ease. A lock is an ingenious device that allows boats to pass between bodies of water on differing levels. A boat enters a lock - essentially a large tank between the two bodies of water – and then the large doors close behind it. The water level in the lock is then either raised or lowered before a second set of doors is opened to allow the boat to pass through onto the new level. The water in and out of the lock chamber is controlled with the aid of paddles – or sluice gates – which are small wooden trapdoors set within the gates or lock walls. The paddles are operated using the windlass – or lock key – that all boaters carry with them. To open a paddle the windlass is fitted into the winding mechanism and then wound up many times. Part of the fun of working a lock is because it is a team effort. At the very least it is conducted with one person operating the paddles, and one person on the boat, helping to maintain its position through the lock. Many boaters prefer to just use the engine to enter the lock and to help keep its position. However, it can also be controlled with the aid of ropes operated by the shore-based crew. If the rushing waters makes it difficult to control the vessel, then ropes can also be used to restrain the boat by tying them around a nearby bollard. If the lock is full of water it must be emptied before the bottom gates can be opened to allow the boat to enter. After making sure all the gates and top paddles are closed, the bottom paddles can be wound up to let the water out. Once the water level has lowered enough to allow the bottom gates to be opened, the paddles can be wound back down again. Once the water in the lock is at the same level as the boat, the bottom lock gate can be opened and the boat steered into the lock chamber, with the lock gate closed behind. The bottom paddle is then opened to allow the water to flow from the upper pound (stretch of water between locks) into the lock. The boat will then rise as the lock fills with water. Once the water level inside the lock is the same as that of the upper pound, the upstream gate can be opened and the boat allowed to proceed down the waterway. Always remember to check that both the paddles and the lock gates have been closed behind you when leaving the lock. If the lock is not full of water it must be filled before the top gates can be opened to allow the boat to enter. After making sure all the gates and the bottom paddles are closed, the top paddles can be wound up to let the water in. When the water level has risen enough to allow the top gates to be opened, the paddles can be wound back down again. Once the water in the lock is at the same level as the boat, the upstream lock gate can be opened and the vessel steered into the lock, with the lock gate closed behind. The top paddle is then opened to allow the water to flow out of the lock into the lower pound. The boat will then lower as the water level in the lock falls. Once the water level inside the lock is the same as that of the lower pound, the downstream gates can be opened and boat allowed to proceed down the waterway.